Inner Demons has a lot of familiarity to overcome. From its possession premise to its found footage approach, it looks very much like a movie we’ve seen at least a half-dozen times in the past few years. It almost takes guts to even bother tossing your hat into this pentagram-adorned ring at this point. As they say, however, the devil is in the details, and it’s those details that manage to separate it from the pack, if only just enough to justify itself. It also happens to be mostly well executed and features a fairly unique hook, which helps its cause. Framed as an in-production episode of a reality television show that stages interventions for drug addicts, it immediately grounds itself and gives a reason for its found footage aesthetic. Cameras have descended on the Morris home in the southern California suburbs, where sixteen-year-old daughter Carson (Lara Vosburgh) has fallen prey to heroin needles and depression pills. Once a model Sunday school student capable of spitting out Bible verses on command, she’s also gone Goth, much to the dismay of her parents. Demonology books adorn her room as much spoons and lighters, something that doesn’t go unnoticed by cameraman Jason (Morgan McClellan), who begins suspect supernatural, sinister forces have led Carson astray. 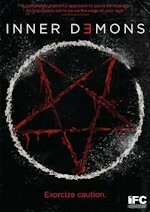 By straddling science and religion, Inner Demons almost approaches an intriguing line of ambiguity before backing right off of it and settling for a thinly veiled possession-as-addiction metaphor. And by “thinly veiled,” I mean a character says “I guess it’s a metaphor…” at one point. These inner demons are literal manifestations of her psychological ones, you see. Or perhaps it’s the other way around: as we come to understand Carson, we realize that she’s only turned to drugs in order to quell the spirits threatening to consume her soul. Her vice adds another dimension of suspense to the situation, especially once she lands in a rehab clinic that forbids her access to drugs, turning into a ticking, Satanic timebomb ready to explode. It’s here that the demon begins to reveal itself in group therapy sessions, allowing Inner Demons to run through some of the typical possession paces. Fellow addicts look on in bewilderment as foul-mouthed, gravelly-voiced Carson inexplicably exposes their darkest secrets, while an attempt at an improvised exorcism using holy water leads to a vomitus conclusion. Accenting these more overt scares are is the usual found footage bric-a-brac: well-placed jolts, eerie imagery, and a sort of creeping terror underpinning the proceedings cribbed from both the mockumentary frame and unsettling images from surveillance cameras and cell phone footage. Inner Demons features quite a collection of familiar but effective sequences made even more authentically disquieting by the found footage approach—this is why this particular technique endures (well, that, and it’s cheap). As it indulges in the expected schlock, Inner Demons does little to shake its familiarity, but Vosburgh's performance makes it gripping nonetheless. Possession films often task its leads with notable transformations—eventually, an actress will inevitably find herself performing bodily contortions while caked in demon make-up—and this one is no different. What’s more notable than this inexorable turn is the subtlety guiding Vosburgh’s performance there. In her private moments with Jason (who develops a puppy-eyed affection for her), Carson’s voice has a childlike lilt, her face a soft, innocent complexion, both of which become warped into sharp, angular expressions when her demons well up inside her. Films in this subgenre live and die by these central performances, and Vosburgh delivers one that keeps Inner Demons intriguing throughout. Without it, the film’s climactic turn towards butcher knives and pentagrams might still be cool but likely less affecting. Once the film leaves the confines of the detox clinic and retreats to dark, suburban secrets, you almost wish it had never left. Between the father’s relapsed alcoholism and the mother’s devout but oblivious Bible-thumping, Inner Demons has more than enough subtext to explore the destructiveness of deceptively tranquil suburban homes. Brief moments—such as the mom’s freakout about Carson’s goth lifestyle—hint at an interesting indictment of regressive fundamentalism before the screenplay retreats to the stuff of teenage pranks gone wrong. I Know Who You Possessed Last Summer might have also been a fitting title. 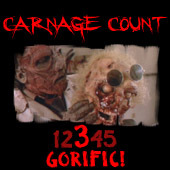 Still, the climax truly jolts and leaves audiences with a couple of gory gut-punches. Inner Demons becomes something of an impromptu slasher, complete with suspenseful stalking and grisly comeuppance. Sometimes, it only takes a willingness to effectively mix genres to raise an eyebrow and have an audience take notice, even if it’s combining two exhausted flavors. Only a month ago, The Gallows confirmed that mixing found footage with slashers is a difficult proposition for an entire feature, but Inner Demons reveals the possibility of it working in bursts, at least. That director Seth Grossman sort of “cheats” also helps—there are times when the footage in question couldn’t come from the in-movie cameramen, and the film is edited in scored in such a manner that it could not truly be the “rough cut” and “raw footage” promised by the intro. By now, however, questioning this sort of thing feels akin to questioning the logic behind teenagers constantly returning to Crystal Lake. You just sort of have to go with it, especially when a film like Inner Demons bends the rules in service of the big picture.